The catalogue description of this image suggests that it is a man standing on a castle, but the benefits of "Super Dooper Mega Zoom" (technical term) show that this is not the case. 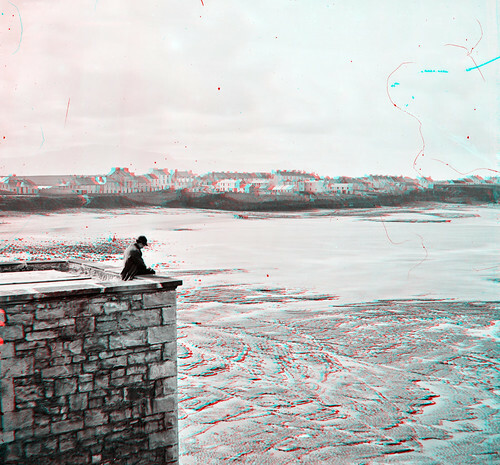 The man is sitting on a fairly modern building looking out over tidal flats with a town in the background. I suspect that this will take some time to identify but then the Lemur, Sharon or Niall are just as likely to make a liar out of me! Where is it? And, with his first (and critical) hypothesis, John McK has established that this is Bundoran, County Donegal. Thanks John! Well, I don't recognise it, but I've got till Niall and Sharon get out of bed to see what I can figure out with a map. I suspect Strangford Lough though, so the map may not be much use. Doesn't ring any bells, but there are hills/mountains beyond which do not suggest Strangford Lough? [https://www.flickr.com/photos/gnmcauley] True. Also, the sun/shadows suggest we're looking west along a north facing coast (I think). I like Bundoran - the flats here look like rock rather than mud. [https://www.flickr.com/photos/[email protected]] [https://www.flickr.com/photos/gnmcauley] Bundoran it is. Streetview (Closest I could get - the photo was taken from further to the right). The yoke (technical term) he is on is still there: streetview. It is not on the 1837 6" map. goo.gl/maps/cL5yKmyuVuR2 Reverse view, from the church. And very well spotted [https://www.flickr.com/photos/[email protected]] !! [https://www.flickr.com/photos/gnmcauley] Thanks Niall, been patiently waiting for an opportunity to contribute for a long time :-) Definitely my favourite acct on Flickr. Virtual Sticky Bundoran for [https://www.flickr.com/photos/[email protected]] ! www.buildingsofireland.ie/niah/search.jsp?type=record&... Christ Church has a date of construction 1850-1880, which replaced the chapel in ths picture.